© 2015 Tupperware. All rights reserved. Tupperware Brands Corporation is the leading global marketer of innovative, premium products across multiple brands utilizing a relationship-based selling method through an independent sales force of 2.9 million. Product brands and categories include design-centric preparation, storage and serving solutions for the kitchen and home through the Tupperware brand and beauty and personal care products through the Avroy Shlain, BeautiControl, Fuller Cosmetics, NaturCare, Nutrimetics and Nuvo brands. Only $18 with any $35 order of items from the catalog! For information or to schedule a party, contact your Consultant, visit us online at www.tupperware.com or call 800-TUPPERWARE or 1-800-887-7379. Prices in this catalog are suggested retail prices in U.S. dollars and are subject to change without notice. For your convenience, you may pay by check, cash or with these credit cards where available. Please pay your Tupperware Consultant at the time you place your order. Products sold by Tupperware U.S. are BPA free. THERE’S NOTHING MORE IMPORTANT TO US than celebrating the success of our incredible Tupperware business owners who truly love what they do. Learn how Judi Daugherty follows her passion to create the life she wants. ➜ I love Tupperware parties. It’s fun to meet new people, learn recipes and tips from others and, I especially enjoy, the circle of friendship that continues to build. Using social media, it’s so easy these days to meet someone at a party and later connect with them socially on the Internet. My network has really grown through Tupperware—I have lots of friends these days. There’s always something new at a party. Many people think they have everything they need for their homes. And for them to see our new products and learn how the products streamline daily routines and help busy moms make quick dinners is always a lot of fun. I love helping people that way! But Tupperware is special because we offer more than a night out at a Tupperware party. We offer a fantastic opportunity for growth. Growth of your own Tupperware business and of personal growth. It’s an amazing feeling to help build someone’s confidence and watch her do more than she ever believed she could. When we share the Opportunity with someone and they begin their Tupperware business, we change someone’s life. That’s giving women and men a lot of change within their families—and their own legacy then builds for years to come. It’s such a gift. And I love that I’m a part of that! When we share the Opportunity, we change someone’s life. When you see this logo, it’s your cue to party. Throughout this catalog, it’s pictured alongside the fast and delicious meals, snacks and treats you and your Consultant can make when you date and host your next party. Visit tupperware.com to learn more about the products, hosting a party and becoming a Consultant. Skip the line—and the added sugar— at the smoothie shop. The Press Master Juicer is an easy way to juice at home. Supercharge your juicy summer with help from Tupperware, the founders of fresh—naturally. Splash into delish! Eliminate added sugar and preservatives by making your own juice with the Press Master Juicer. Boost immunity and improve vitality with wholesome foods. Discover new-found wellness—drink to your good health! Jumpstart your juicy summer! 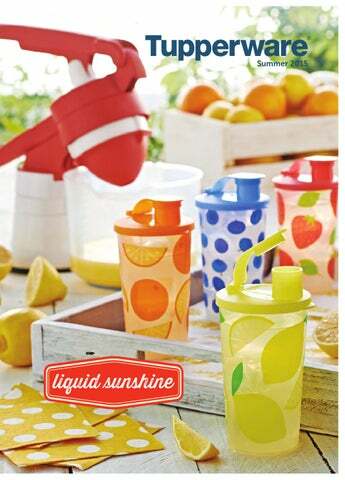 Check out Pinterest.com/ tupperwareusca for sippable summer recipes. To lock in nutrients, freeze freshly pressed juice in our Fruit of the Summer Tumblers! Ready to chill with friends while seeing the hottest products in action? Create cocktails, mocktails and more using the new Press Master Juicer at your next Tupperware party. *Artwork not covered by Limited Lifetime Warranty. Turn handle easily controls speed of processing. Complete the collection with the exclusive Thatsa® Jr. Bowl, yours FREE when you host a qualifying party (see pg. 76). Ingenious design first cuts then lif ts slices. With our classic takers, you’re ready to bring happiness to any sweet family gathering, now and always. Set includes Foil Cutter: Stainless steel blade for safe and easy removal of wine seals. Wine Pourer: Aerates while pouring for a gentle, controlled flow of wine. Enjoy the best of what summer has to offer at your next Tupperware party with this Blueberry Corn Salad. Ask your Consultant about how to bake up sweet and healthy Cinnamon-Vanilla Apple Chips. Prep with precision. Easily cut into eight different shapes. Flip-top cap snaps open for easy dressing dispensing. For this and other layered salad ideas, find us at Pinterest.com/ tupperwareusca. A clearly beautiful way to keep oils, marinades, vinegar and other essentials at your fingertips. With liquid-tight cap, one-touch open/close lever and unique pour spout for dripless dispensing. Cooking purely with steam in the microwave retains food’s moisture, flavor and nutrients for leaner, healthier meals. With the Tupperware® SmartSteamer, you save time while cutting calories. Looking for the low down on this 20-minute Low Country Boil? Ask your Consultant for a demo at your next Tupperware party! The latest addition to our high-tech microwave cooking collection. Juicy pot roast, hearty pasta and creamy risotto cooked to perfection in mere minutes. An easier way to al dente. Make pasta without the stove. *Limited Lifetime Warranty on the Microwave Pressure Cooker does not cover silicone parts. Flexible, silicone venting system allows steam to escape. Vent ’N Serve® Containers Whether it’s home cooked or home delivered, it’s smart to plan on saving and reheating leftovers (which we like to call planovers). The versatile Vent ’N Serve® containers are fridge, freezer and microwave safe so they always fit with your dinner plans. Heat ’N Serve® Containers Get a handle on options for your meal prep and on-thego needs. This self-venting collection features hinged handles for easy opening and ideal sizes for grab-andgo convenience. They are also fridge, freezer and microwave safe. Note: Vent ’N Serve® Containers and Heat ’N Serve® Containers are intended for reheating, not for microwave cooking. Typical reheating is at 50–70% power, depending on the wattage of your microwave. Check your owner’s manual for more information. Have a hot lunch date? With CrystalWave® containers you can take along all of your favorite lunches. Pushbutton, steam-vent seals make it easy to microwave reheat so you can get steamy anytime, anywhere. Note: CrystalWave® containers are intended for reheating, not microwave cooking. Typical reheating is at 50–70% power, depending on the wattage of your microwave. Check your owner’s manual for more information. Fridge Stackables It’s summertime and living should be easy. Conveniently store cold cuts and toppings for an at-home or on-the-go sandwich station. Redesigned Fridge Stackables feature an improved seal for portability and new grids. Great for picnics, road trips and any sort of summer break. Large size only available in the Family Set! FridgeSmart® Containers Preserve your natural resources by keeping them fresher, longer. Simply adjust vents as directed to control airflow and moisture, preventing hundreds (or thousands!) of dollars in food from going to waste each year. How do you vent that veggie? Your Consultant is the fresh expert. Ask for more detailed tips and instructions. Freeze-It™ Containers Summer doesn’t have to end. Freeze produce at the peak of the summer season to enjoy year-round. Or refrigerate for long-lasting flavor with these versatile, fridge-and-freezer safe Freeze-It™ containers. Looking for a healthy pick-me-up that will cool you down? Visit Pinterest.com/tupperwareusca to find out how to make flavorful ice pops with Lollitups® and other Tupperware® products. 1 large russet potato sliced into ¼"/.5 cm rounds, about 8–10 slices ¼ tsp. coarse kosher salt 1 cup shredded cheese ¼ cup sour cream 2 tbsp. bacon bits 1 green onion, sliced thin 1. Preheat oven to 350° F/175° C. 2. Lay potato rounds in a single layer on UltraPro Oven Plate. 3. Sprinkle with salt and cheese. 4. Bake 10–15 minutes or until potatoes can be pierced with a fork and cheese is melted. 5. Top with sour cream, bacon and green onion. Serve warm. Check out Tupperware.com for quick, great-tasting recipes like Homestyle Mac ’n Cheese. Griddle features state-of-the-art nonstick coating. Chef Series Cookware Our professional-grade, stainless-steel collection is made to last. Pieces feature tri-ply construction plus an encapsulated base, which is another thick, bottom layer of aluminum fused between stainless steel for fast and even heating. Get cooking! As a new Consultant, you can earn the 9-Pc. 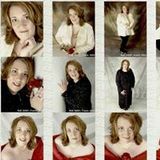 Set FREE through the Confident Start Program (see pg. 79). Universal Series Knives A high-performance collection with colorful, protective sheaths for a lifetime of delicious meals. Kitchen Tools Durable, well-designed essentials are ideal for use with both UltraPro Ovenware and Chef Series Cookware. An organized pantry is a happy pantry. With spill-proof seals to keep food extra fresh, Modular Mates® containers help you store more and maximize shelf space. Buy in bulk and store quantities of staples such as flour, rice, snacks or dry pet food. Shape makes it easy to scoop contents. 7¼ x 7¼"/ 19 x 19 cm seal. FREE Oval Pour-All Seal with Set. Pour-All Seal sold separately. Container not included. Way easier than remodeling. Like Judi, many of our Consultants specialize in Custom Kitchen Planning. Date a party to find out how to make the most of your cabinet space. For bulkier dry goods like chips, pretzels, noodles and more. 11 x 7¼"/28 x 19 cm seal. 3 FREE Super Oval Pour-All Seal with Set. Includes measuring insert for 1 or 2 servings. Helps your child develop hand-eye coordinatio n.
©1976, 2015 SANRIO Co., Ltd.
ready for a road trip? This trio loves summer adventure! These adorable, sturdy bottles go way beyond water. Serve the kids healthy juices and snacks or pack your own with protein shakes, vitamins and your favorite snacks for on the go. Drinking just a little more water throughout your day can make a real impact on your health, and doing so with durable, reusable bottles makes the planet feel better, too. Date your Consultant for more tips on living green. All sizes include the new, sheer Easy Sipper cap! Buy both for a complete cutlery set! ON THE GO a New! Hamptons Lunch Set You don’t have to summer in the Hamptons to enjoy a relaxed, coastal vibe. Take a seaside break anytime with this nautical themed lunch set. Includes insulated bag with starfish zip charm Q, 2½-cup/600 mL CrystalWave® Round Container and Sandwich Keeper. 1595 Crushed Raspberry/Indigo $35.00 See page 73 to find out how to get more by giving back. Fits into Extra Small Eco Water Bottles! Nothing goes better with flip-flops than flip-tops! Round up your order to change lives* Round up your order to the next highest dollar and we’ll contribute the difference to the Tupperware Brands Foundation to support organizations like Boys & Girls Clubs of America and others. For each of these items you purchase, we’ll donate a portion of the purchase price to the Tupperware Brands Foundation to support organizations like Boys & Girls Clubs of America and others. Every afternoon in America, 15 million kids leave school with no place to go. But, when school is out, clubs are in! Help support an incredible cause and the millions of incredible kids that Boys & Girls Clubs of America are honored to serve. In the past five years alone, Hosts and customers like YOU have helped our Sales Force Members raise over $2.4 million for the Tupperware Brands Foundation. Limited Lifetime Warranty Tupperware® brand products are warranted by Tupperware against chipping, cracking, breaking or peeling under normal non-commercial use for the lifetime of the product. Call your Tupperware Consultant or Director for free replacement. If, due to unavailability, actual product replacement cannot be made, comparable product replacement will be made, or credit toward future purchases of Tupperware® brand products will be given. This warranty gives you specific legal rights, and you may also have other rights which vary from state to state. Warranty replacement items or parts will be subject to shipping and handling charges. Quality Warranty Products in this catalog marked with the Q symbol are warranted to be free of manufacturing defects for one year. If you receive a product you believe to be defective, please return it within one year of purchase to your Tupperware Consultant or Director for a free replacement. If, due to unavailability, actual product replacement cannot be made, we will credit the full purchase price amount toward future purchases of Tupperware® brand products. Warranty replacement parts or items will be subject to shipping and handling charges. For more information about the Tupperware Brands Foundation, visit tupperwarebrands.com and click on “Social Good.” All voluntary donations are to the Tupperware Brands Foundation to support organizations like Boys & Girls Clubs of America and others. 30-day Warranty Products designated with the G symbol are warranted to be free of manufacturing defects. This warranty does not include chipping or breakage of glass or china items due to dropping. If you receive a product you believe to be defective, please return it to your Consultant or Director within 30 days of purchase for a free replacement. If, due to unavailability, actual product replacement cannot be made, we will credit the full purchase price amount toward future purchases of Tupperware® brand products. Warranty replacement items or parts will be subject to shipping and handling charges. All Tupperware® products are dishwasher safe unless noted. Actual product colors and appearance may differ slightly based upon photographic and printing limitations. Food items and props pictured with products not included. Products shown not to scale. Microwave Pressure Cooker The silicone parts are excluded from the Limited Lifetime Warranty. Chef Series Collection & UltraPro Ovenware Chef Series Culinary Collection & UltraPro Ovenware carry a limited lifetime warranty against defects in the material or workmanship under normal or household non-commercial use. Warranty coverage does not include breakage due to dropping for Chef Series glass covers or UltraPro Ovenware. Non-stick coating carries a 10-year limited warranty against defects in the material or workmanship. Limited warranty specifically excludes damage to non-stick coating attributable to misuse, accidents or alterations to the products, or any damage which does not impair the functionality of the product. Tupperware shall have the right to determine if the item is defective and, at its option, replace it with a similar or equivalent item, or provide credit toward future purchases of Tupperware® brand products. Warranty replacement requires shipping the product to Tupperware at your expense. The following actions will invalidate your Chef Series warranty: • Using non-stick cookware on high heat for an extended period of time. • Washing non-stick cookware in the dishwasher. • Using metal utensils on any non-stick surface. • Using scouring pads, steel wool, abrasive cleaners or bleach. Tupperware Directors are listed in the telephone directory White Pages under “Tupperware.” If no Director listing appears in your area directory, please write to Tupperware Customer Care Department, P.O. Box 2353, Orlando, Florida 32802. Or call 800-TUPPERWARE (800-887-7379). Turn the page to find out how to qualify for this Host Gift Special and more. *Limit one with party sales of $450 or more and two friends who date and hold their own parties within 21 days. When you date a Tupperware party, there are a lot of reasons to celebrate: you get to try one of the delicious Date Me recipes shown in this catalog (or another specialty of your Consultant’s), you get some much-needed face time with friends AND you get the chance to earn a bunch of free stuff, based on your total party sales. No strings attached. How cool is that? Enjoy HOST CREDIT & Half-Price Selections Earn Host Credit and use that credit to shop for FREE Tupperware® products. The higher your party’s sales, the more Host Credit you’ll earn. At the same time, you’ll qualify to purchase up to three additional products of your choice at half price. HOST a Party As a thank you for hosting and providing recipe ingredients, when your party’s sales reach $175 or more you receive your choice of one of these Date & Hold gifts FREE. Keep the parties going! When your party achieves qualifying sales and two or more of your party guests date and hold their own parties, you qualify for exclusive Host Offers that give you more value, like the Host Gift Special featured on pgs. 74–75. Host Credit and half-off purchases may be redeemed for ANY item in this catalog, except the fundraising items and special offer featured on back cover. Half-off purchases and Host offers do not count toward the party sales used to calculate Host Credit. Future datings must be held within 21 days. Shipping & Handling is free for all items purchased with Host Credit. Shipping and handling is charged on items purchased without Host Credit, co-pay offers and half-off items. Where will the party take you? Order your Business Kit and receive all the Tupperware products and business tools you’ll need for a successful start. • Earn up to 35% on your personal sales. Need extra cash or looking for a career you can love? Get paid to party by demonstrating our products for friends and family. This flexible DIY business opportunity allows you to control your own income. Even easier, as a new Consultant in the Confident Start Program, we’ll make your second payment for you when you achieve $900 in personal sales within your first 60 days. *Prices shown here do not include applicable taxes. *When you self-register at Tupperware.com, your credit card will be charged the full amount of the Kit. Through the Confident Start Program, when you achieve $900 in personal sales within your first 60 days, you’ll receive a credit of $69 toward your next Tupperware order. Business Kit contains over $340 in Tupperware® products & business tools.